Ezra Milford Jones, left, Gus Winkler and Fred Burke are pictured in St. Louis, Mo., 1925. The photo is from the St. Louis PD. Fred Burke (May 29, 1893 – July 10, 1940) was a Midwestern swindler, armed robber and contract killer responsible for many crimes during the Prohibition era. He remains a prime suspect in the infamous St. Valentine’s Day Massacre of 1929. Born Thomas Camp on a farm near Mapleton, Kan., his first known criminal activity was at age 17 when he was duped into a land fraud scheme by a traveling salesman who had befriended his family. He next surfaced in the underworld of Kansas City and by 1915 was in St. Louis wher he joined the infamous Egan’s Rats gang. Tall and well-built, Burke often posed as an honest businessman to pull off his schemes. Under indictment for forgery, Burke enlisted in the U.S. Army at the beginning of World War I and served with honor as a tank sergeant in France. Once home from the war, however, he quickly fell in to his old profession. Burke was soon arrested in Michigan for a land fraud scheme and sentenced to a year in prison, to be followed by another year in Missouri on the forgery crime. By early 1922, Burke was back with Egan’s Rats, along with his friends Gus Winkler, Bob Carey and Raymond "Crane Neck" Nugent, all St. Louisans and World War I vets. Close-mouthed and competent, Burke and his pals were suspected of robbing a St. Louis distillery of $80,000 worth of whiskey in April 1923. Burke disguised himself as a police officer to fool the plant’s security guards. He also plotted and carried out the robbery of the United Railways office, the city’s streetcar provider, on July 3, 1923. The heist netted $38,000. 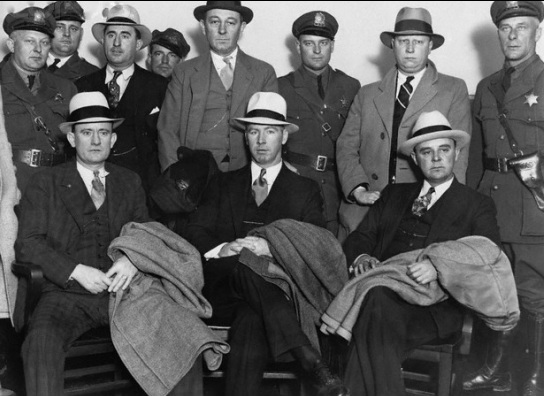 With the imprisonment of the Egan leadership in 1924, Burke and his pals relocated to Detroit, where they began committing armed robberies and murders in the surrounding region, often at the behest of Detroit's infamous Purple Gang. Burke was suspected of introducing the Thompson submachine gun to Detroit’s underworld on March 28, 1927, in the so-called Milaflores Massacre, when he mowed down three rival gangsters suspected of killing his friend, Johnny Reid. By the summer of 1927, relations between the Burke crew and the Purple Gang had gone sour. Burke accused Purple boss Joe Bernstein of killing his friend Ted Werner in New Orleans on April 16, 1927. The Purples claimed that Burke and his friends were kidnapping associates of the Purple Gang. This feud culminated on July 21, 1927, when Burke was accused of machine-gunning a number of Purples as they exited a bar on Oakland Avenue. Three men were wounded and one, Henry Kaplan, was killed in the attack. Purple bosses Abe and Joe Bernstein sent word that they wanted to meet with Burke and Winkler at a downtown Detroit hotel. The St. Louis gangsters sent Raymond Shocker in their place, who was nearly killed in the trap. After their falling out with the Purples, Burke and his crew moved to Chicago, where they joined with Al Capone’s organization, establishing an autonomous relationship similar to the one they formerly had with the Purples. Burke and Winkler, especially, grew close to Capone, who referred to them as his "American Boys." Some Italian gangsters in the Outfit, notably Frank Nitti and Paul Ricca, allegedly resented how close Capone was to the pair. Over time, Burke and his crew were suspected of robbing banks and armored cars in St. Louis, Louisville, Ky., Paterson, N.J., Jefferson, Wis. Cadillac, Mich., Peru, Ind., Los Angeles and Toledo, Ohio. The latter job, on April 16, 1928, resulted in the murder of Toledo police officer George Zientara. Burke and his partners were also linked by ballistic evidence and informants to the murder of Brooklyn mob boss Frankie Yale on July 1, 1928. Most notably, the Burke crew remain suspects in the St. Valentine’s Day Massacre of 1929 in Chicago. Burke was publicly named as a suspect by Chicago police in the weeks after the killings. Additionally, Barker-Karpis gang member Byron Bolton would later give a detailed 1935 statement to FBI agents, in which he claimed to have taken part in the massacre at Capone’s behest, along with Burke, Winkler, Bob Carey, Ray Nugent, Claude Maddox, Fred Goetz and others. Bolton’s claims were later corroborated by Winkler’s widow Georgette and a maverick Chicago detective named William Drury, who had stayed on the case long after everyone else had given up. Bank robber Alvin Karpis later endorsed Bolton’s story to Capone biographer John Kobler. Burke’s downfall came after he had a traffic accident with a motorist in St. Joseph, Mich., on Dec. 14, 1929, Burke, in a moment of alcohol-induced paranoia, shot and killed Patrolman Charles Skelly when he came to investigate the fender bender. When police raided his bungalow, they found a bulletproof vest, bonds recently stolen from a Wisconsin bank, two submachine guns, pistols and thousands of rounds of ammunition. Ballistics tests conducted by nationally-renowned expert Calvin Goddard revealed that both of Burke’s machineguns had been used in the St. Valentine’s Day massacre; the same tests showed that one of them had been used to murder of Frankie Yale. Named as America’s most wanted man, Burke spent the rest of his criminal career on the run. He allegedly murdered a Chicago hood named Thomas Bonner at a Michigan cottage in July 1930, after Bonner had threatened to turn him in to Chicago police. Fred Burke managed to elude the police for over a year, until he was arrested at a farm near Green City, Mo., on March 26, 1931. Convicted of Skelly’s murder, he died in prison of heart disease at the age of 47. Six men, alleged members of the Fred Burke Gang, were captured in a spectacular raid in East St. Louis, Ill., and were brought under heavy guard, to Chicago on May 11, 1929. They were to be paraded, at a police 'show-up,' by witnesses to the St. Valentine's Day Massacre, bank robberies and kidnappings. Altogether, police believed that the group has participated in about 20 murders and bank robberies in which nearly $10,000,000 was taken. The six captives pictured at the Chicago Police Headquarters, were, from left seated, Tommy O'Connor, Howard Lee and Edward O'Hara. Standing from left, in civilian clothes, Jack Britt, Tommy Hayes and William McQuillan.